Ford Radio Codes | Get Your Code In Seconds Guaranteed. 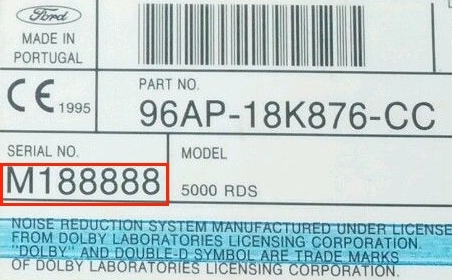 You can unlock the radio in your Ford car or van from the serial number beginning with BP, C7, M or V. You will find the serial number printed on a label or by pressing 1 & 6 on the radio. All Ford Radio Codes appear on your screen instantly following secure payment. Prefer To Get Your Code INSTANTLY Over The Phone? Guaranteed 50% Cheaper Than Ford! 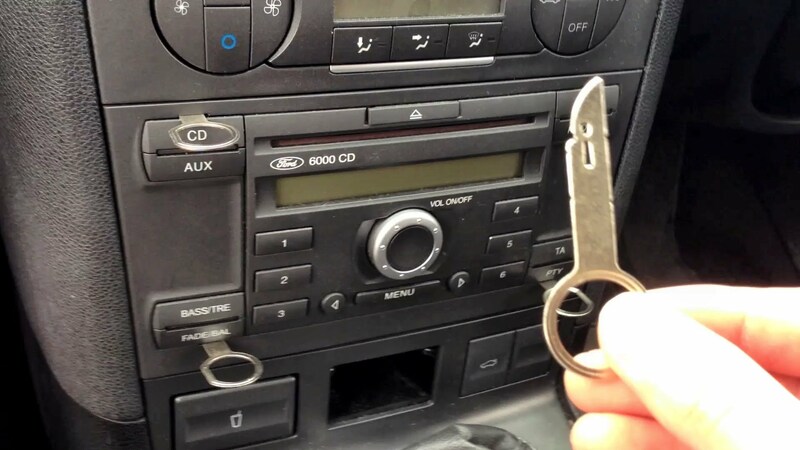 Taking out your Ford CD or cassette player is fairly straight forward using a set of Radio Removal Keys, if your radio has two small holes in each corner you will need to use a pair of PC5-83 keys. 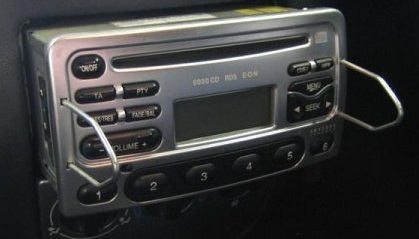 If there are four slots on the front of your radio you will need to use a set of four PC5-132 keys. You can purchase the keys required by telephone 01379 770075 from 9 am to 6 pm or you can order them using our Ford Radio Removal Keys page. If you order a set of keys today you will receive a 10% discount off your Radio Code using the PROMO code that we enclose with the keys just to help you that little bit more. 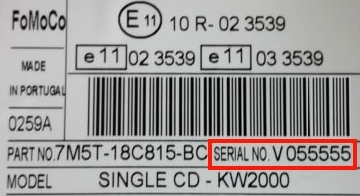 Once you have removed the radio you will see a Ford label with the serial number printed on it similar to the examples below please note all serial numbers are different. Ford Radios manufactured by Visteon, Sony, Johnson Controls, TOPPOWER, FoMoCo, Blaupunkt & Bosch are covered in our Instant Code Retrieval Service. Once you have the serial number, enter this into the code search form to get your radio unlock code online by credit or debit card or by using your PayPal account, you can also telephone 01379 770075 from 9 am to 6 pm seven days a week to pay for your code using your credit or debit card. All Ford Car Radio Codes are available instantly following payment either online or by telephone. Once you have purchased the code we archive it for Life so you never pay for the same code twice. Our Free Ford Radio Code retrieval service is available by telephone only from 9 am to 6 pm seven days a week. You can only enter the radio code when you see four horizontal lines with one flashing on the display. If you only see the word wait, then you will have to leave the radio switched on for up to 2 hours to allow the radio to reset. If you see Lock 10 just press and hold the preset button 6 whilst turning the radio on this will give you another 3 attempts to enter the correct code if your radio is showing Lock 13 then the code will be of no use as this radio would need to be manually decoded offline. Press 1 repeatedly for the first digit of your code. Press 2 repeatedly for the second digit of your code. Press 3 repeatedly for the third digit of your code. Press 4 repeatedly for the fourth digit of your code. press & hold the number 5 button until you hear a beep. To enter the code for your Ford LS RNS, LS TFT, HS RNS, 2050, Ford 6500R, 6000 CD MCA Premium, Blaupunkt, Ford Travelpilot EX, RNS4, EX C307, EX CD312 & EX NMD View Our Free Ford Radio Code Entry Instructions. We are no way authorised by or connected to or otherwise associated with Ford Motor Company all copyrights and trademarks are of the respected owner FORD.